With my soon-to-be hubby off playing army I'm always looking for a few ideas for a care package. My Chocolate Chunk Cookies apparently have been a big hit with the soldiers but I wanted to change it up this time. 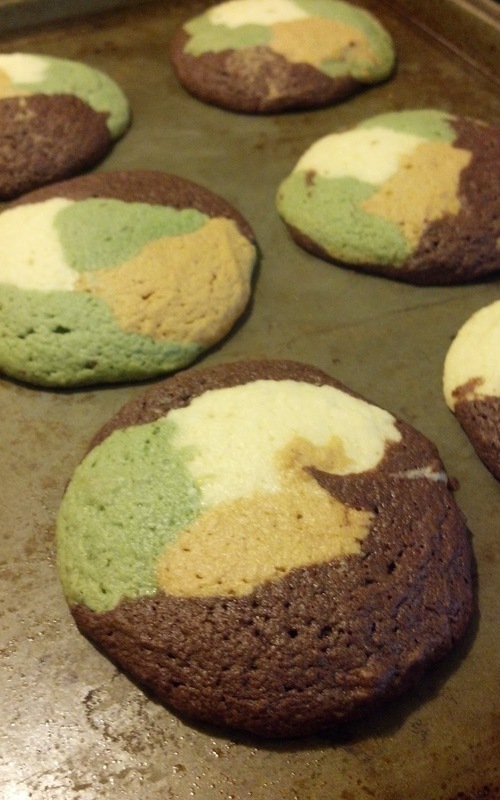 I originally found something similar on Pinterest but it was for a cake.... kind of hard to ship a cake. 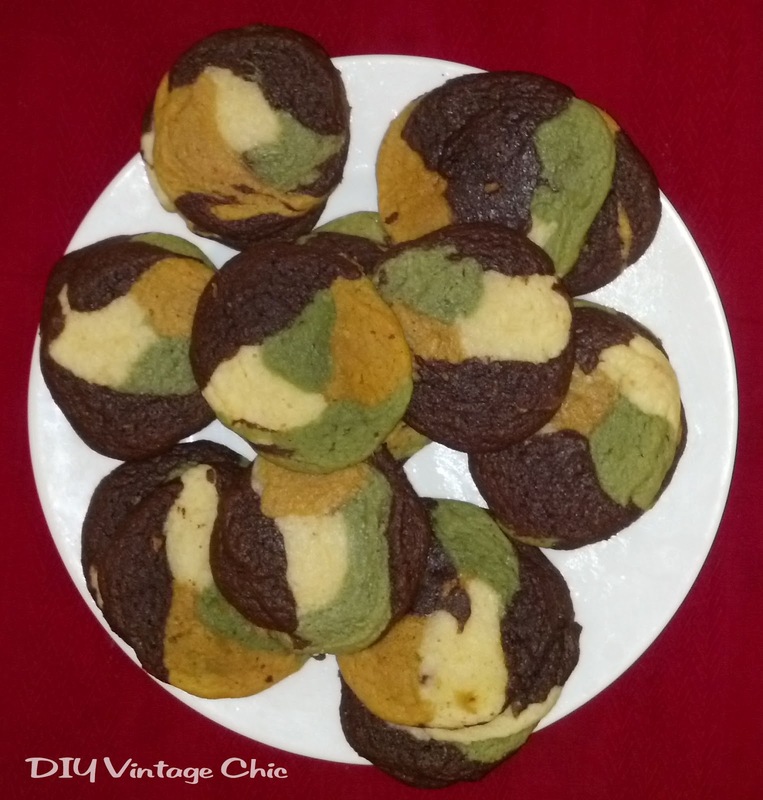 So I tried to think of a few ways to alter it... and I came up with Camouflage Cookies! 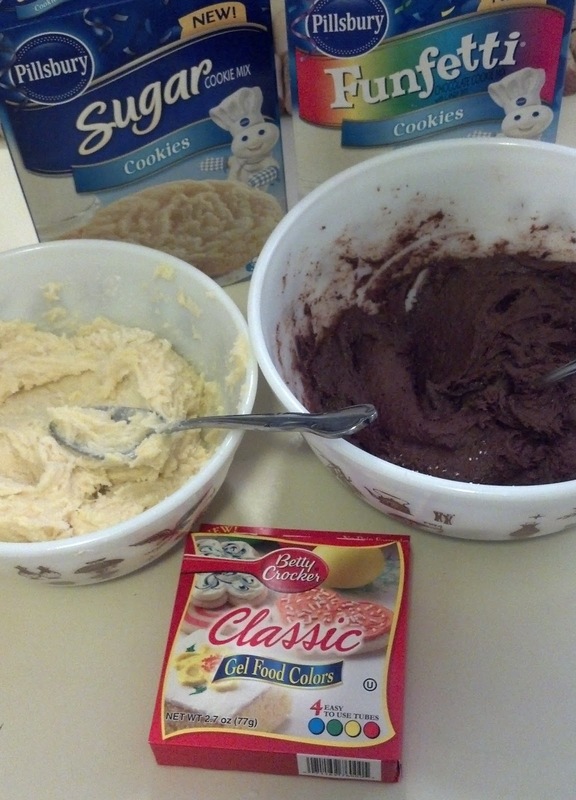 Follow the instructions for both the "white" and chocolate cookie mixes. 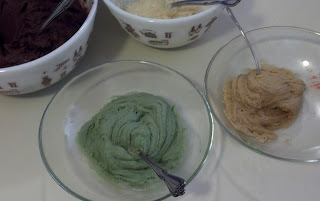 Once they are thoroughly mixed, divide your white mix into thirds and separate each 3rd into it's own bowl. Now comes the fun part.... or frustrating if you are not good at mixing colors. Leave one third of the white mix alone. This will become your tan. Of course for the green I just added my green dye. But the color turned out to be more of a Christmas green rather than an Army green. So I added some yellow and a tad bit of red to dirty it up a little. For the mustard color, I add mostly yellow and then just a little bit of red and green, again just to dirty it up a little. At first I thought I'd pick a pinch of each color and shape them into a ball before placing on the tray. NOT A GOOD IDEA. This batter sticks to your hands like crazy and I ended up licking washing a lot of batter off my hands. 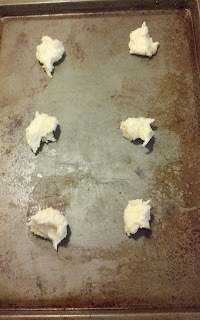 The best method I found was to grab a small amount with a spoon and drop it onto your tray. 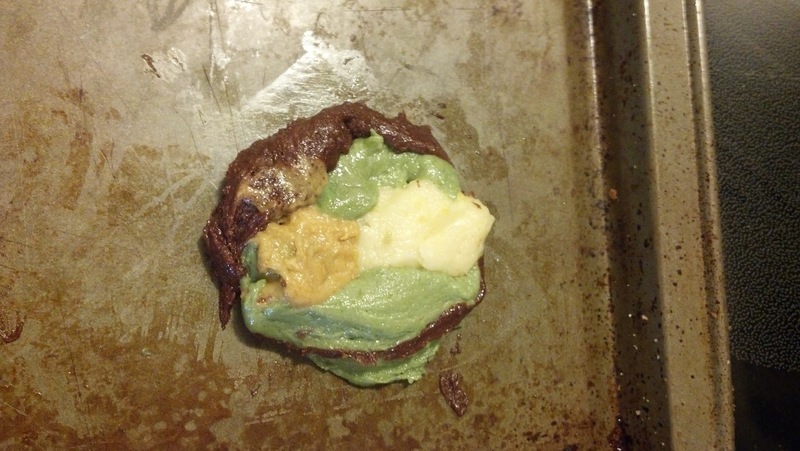 Obviously you're going to have a ton of the chocolate mix which worked out fine. 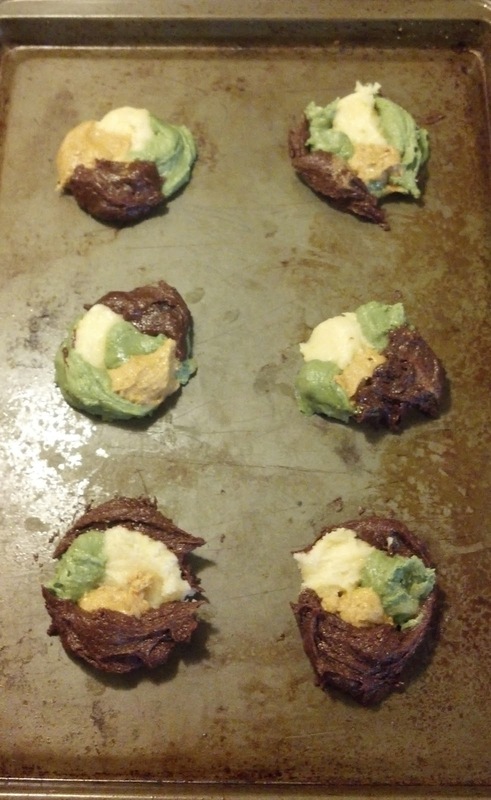 I thought the cookies looked a little better with an additional clump of chocolate added. I also did not do a good job dividing the white batter so I had quite a bit more green than the other 2 thirds. Once they're ready to go follow the directions for your mixes and place them in the oven. SET YOUR TIMER.... I got distracted Skyping with my honey. 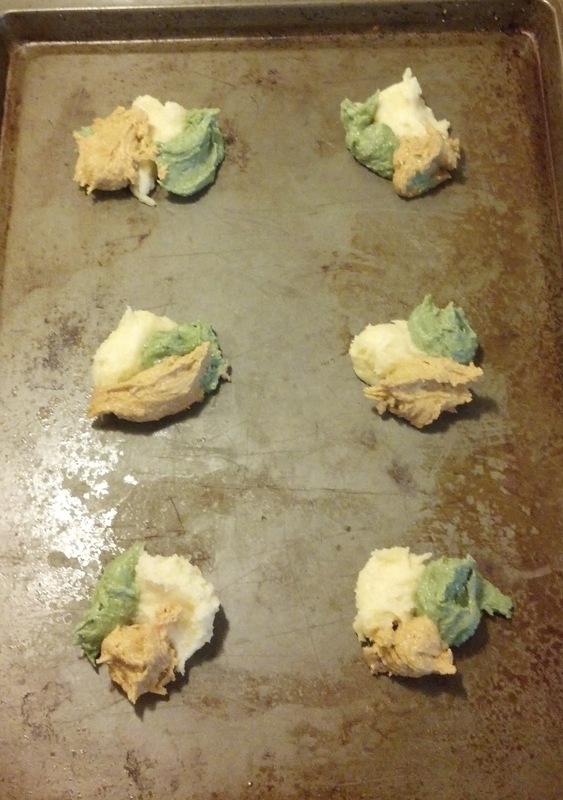 Luckily I didn't ruin the batch though. As I mentioned, there was quite a bit of chocolate leftover. So I made a few chocolate cookies for myself! Linking up on Patriotic Party with Funky Junk Interiors, Mop It Up Monday's with I Should Be Mopping The Floor, Open Call Tuesday with Salt Tree., Creative Bloggers' Party & Hop with Homemaker on a Dime, Wow Us Wednesday with Savvy Southern Style, Primp Your Stuff with Primp Junktion, Penny Pinching Party with The Thrifty Home, Whatever Goes Wednesday with Someday Crafts, Show Me Extraordinary Link Party with The 36th Avenue, Thrifty Thursday with Thrifty Decorating, Friday's Unfolded with Stuff and Nonsense. Those cookies look delish and I'm sure they taste just as good. 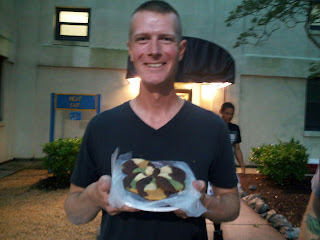 The hubz looks so proud. All the best and take care! Lara, thank you for stopping by and please tell your daughter thank you for her service. I hope she enjoys them! Lol I was going to comment on your no-sew curtains (which I loved by the way) and just as I scrolled down far enough to click on comment, I caught a glimpse of your cookies and they made my mouth water. They do look delicious. I'm not gonna lie.... they are mouthwateringly (if that's a word) DELICIOUS! 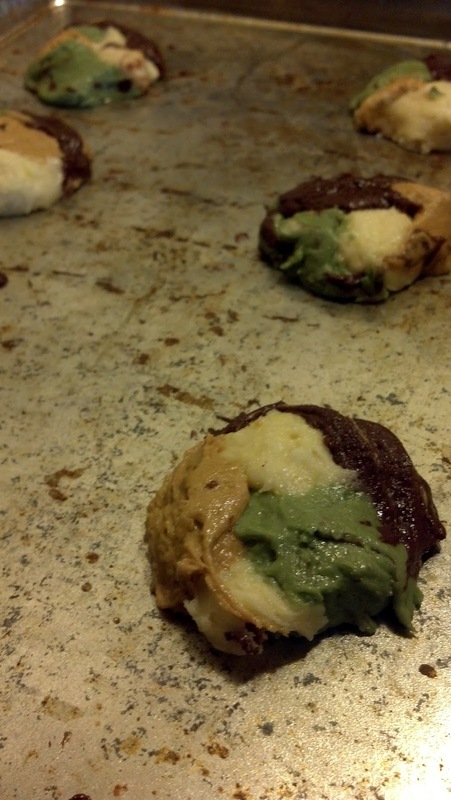 I think it's the mix of regular sugar cookie with the chocolate mix. Thank you so much! I love this idea and have never seen it before. Awesome!!!!! Thanks Alison. I linked them up to Fridays Unfolded and add your button. These are the best idea ever!! 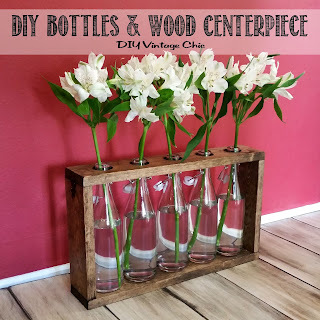 Love it, I'll for sure be making these for my hubby as well! Good luck and tell him thank you for his service! Found you thru Stuff & Nonsense. 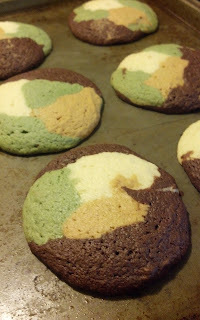 I did hundreds for my sons wedding, but used my cookie gun, mixed 3 shades of camo & loaded alternately in the gun, they came out great !